The ride of 94 Bridges!! The day started with overcast skies and occasional downpours, but after a lazy getup and following porridge for breakfast, the skies stated to clear and we set off for a bike ride which was superposed to be gentle reintroduction to cycling. It was mostly flat and the few undulations we came across could hardly be called hills, but at a distance of 35 miles it posed more of a challenge than anticipated. We set off towards Brecon and soon picked up the Monmouthshire and Brecon canal. 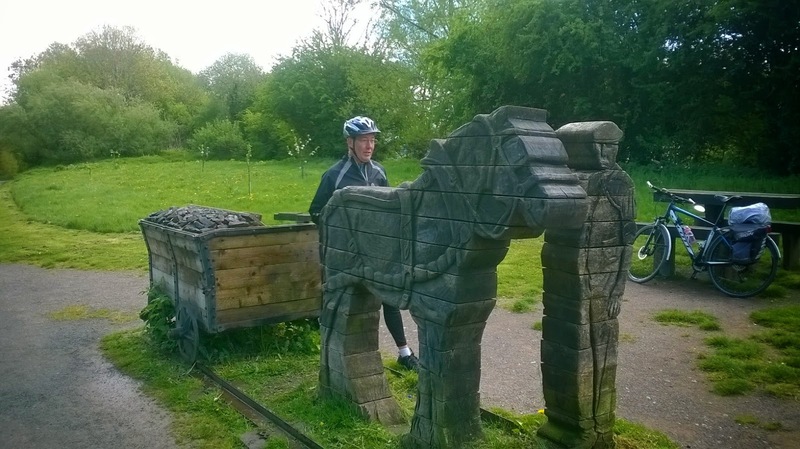 We cycled along the tow path which runs for 35 miles mostly through the Brecon Beacons National Park, and one of the features we noticed was the huge number of little pack horse bridges that span the canal at very frequent intervals. All of them carry a number and occasionally there is an additional 'a' bridge of the same number (121 and 121a), so we started at 166 and rode to bridge 118 - (we went there and back) so therefore, at least 94 bridges! 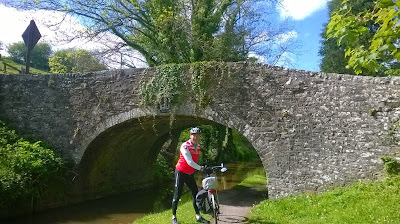 Another interesting snippet - as we approached one of said bridges I saw a sign saying 'reduced draught' I shouted up to John to tell him 'maybe there would be less head wind from now on - but he kindly explained it didn't mean that (dozy mare). And another but not sure if these counted! 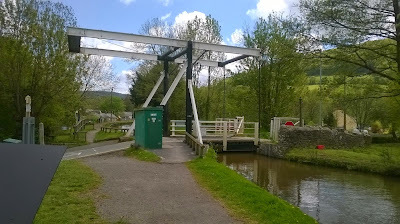 The drawbridge above is operated by a winch system that canal boats, farmers or motorists can use to either open the water way or to allow traffic to cross the canal. From Brecon we cycled along the canal bank and passed through little villages - Pencelli with it's marina, and Talybont-on-Usk with it's very pleasant village shop and cafe. Further along we came to the Ashford Tunnel which is about 2000 feet long and needs to be circumnavigated by leaving the tow path and riding on the road for a short distance (one of the up hill bits). Once back on the tow path we continued for another couple of miles and then decided to stop beside a series of locks for lunch. 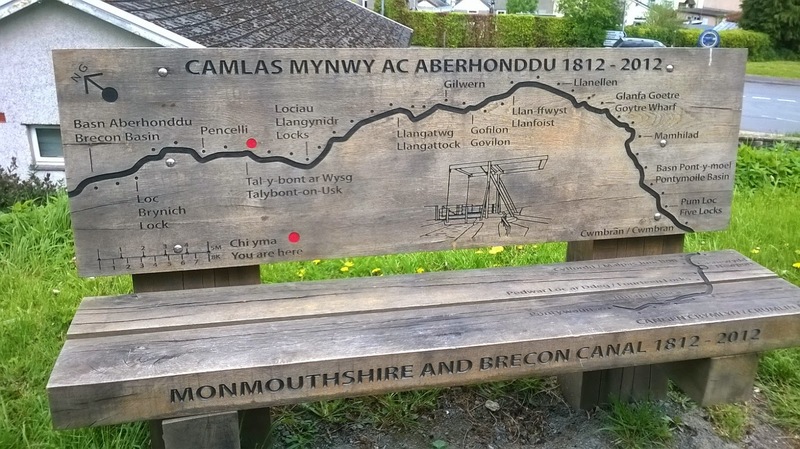 We took up residence on a bench which provided a linear diagram of our route, and sat and munched our corned beef cobs and vegetable crisps in lovely warm sunshine. We then continued on our way for another four of five miles, but we didn't come across anything else (except more bridges) that caught our interest, and as the time was passing by, we decided to turn around and make our way back. However, energy levels were flagging by now so we felt forced to stop in Talybont for an ice-cream,, and later for coffee and cake overlooking a weir on the river Usk, an area that was teaming with wild life (2 grey squirrels and a few ducks). We finally arrived back at The Tardis around 6.45, cooked our dinner and then fell into bed for a lovely sleep. Our time at Brecon was now complete and today is a moving day. We are going to the Gower Peninsula near a little town called Oxwich, however, on the way our plan was to stop off at Llanddeusant to see the Red Kites being fed and this was where the white knuckle ride occurred. Now to set the scene, we have a sat nav called Snooper which is supposed to pick the best route for larger vehicles! That is - it should miss low bridges and shouldn't take us down any single track roads that are unsuitable for us - I think Snooper lost her way to say the least. We were travelling along the A4069 when all of a sudden Snooper said ' in 200 yards take the next left turn'. We dutifully did as we were told and ended up on a single track road. At first we weren't worried, but as the high hedges closed in and the grass formed a green line down the middle of the road we begun to get more concerned and then a little scarred. After about 2 miles Snooper confidently said turn left, however, with the wicked camber and the length of our van (6.3 metres) there was absolutely no chance, and neither was there any chance that we could turn around at this point. Therefore, we had no choice but to go straight forward and continue for another half a mile or so with the road rapidly deteriorating under our wheels. Eventually, we came to a farm yard where we managed to spin around, but now we had the prospect of retracing our tyre tracks back to the main road - a journey of about 3 miles where, if we had met anything coming our way, we would have been in deep poo! Luckily we didn't but it was scary to say the least. By this time I was ready to give up on the Red Kites but John soldiered bravely on and found us a much more acceptable alternative route and I was very glad he did. We saw the Kites very close up and in spectacular flight so the journey, although fraught, was well worth it. Other guests came for tea as well!